Canon, just the sound and thought of it directly deviate you to imaging, cameras, copiers, and the entire family. Meet one of the members in the family of Canon, this is Canon 10x30 IS which is a recent modernized model. It is a powerful piece that's elegant, full of mystery yet with a depth of color and such variation of presence in your hands. It fits well with eye slots and easy to use in viewing. This compact binocular has a great optical condition that is superb and meets one's preference. It is lightweight so you will not find it bulky when going outdoors. Read an in-depth review of this binocular so that you can find its amazing features and benefits and weight if it will meet your needs. Rubber coating, Center-mounted focus, Active image stabilization, Doublet field-flattener, Water-resistant. With its great 10 times of its magnification combined with powerful lenses, the objects you see are well magnified more times than the size one sees with the naked eyes. The lens diameter is large to allow more light to pass in. With such great numerates, the light transmitted in the optic barrel illuminates the object to give you a clear view. So the field of view of 1000 yard away is well magnified by the Canon 10x30 IS Ultra-Compact Binoculars. The zoom feature helps one change often the magnification from the low ranges to high ranges as you search desired object in the field of view. Upon spotting the object fine tune the zoom to glimpse the finer small details that are blurry and fuzzy. With Canon 10x30 binoculars, stabilization is inbuilt and the act of decreasing motion when one is viewing the desired object is important. It's the minimum movement feature that helps one get perfect focus as it reduces the hands and body shaking. Once images are magnified to close ranges, image stabilization button is engaged to ensure immediate image adjustment a high type of technology that imaging groups incorporate. This tech system is able to change electronically and correct the imaging to stability and motion is compensated for as well. 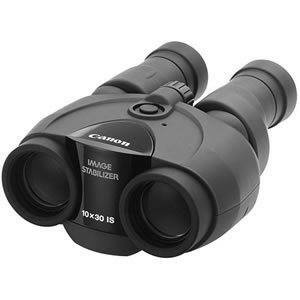 For stable binoculars, Canon is the deal to go for more so Cannon 10x30 IS. Heavy does not mean better nor light mean weak. The light in weight Canon 10x30 IS Ultra-Compact Binoculars is powerful to meet its grind with its ultra-compactness. It is 21 ounces in weight and easy to carry around and does not strain the hand wrist will handle focus as your use of other fixtures in the binoculars. Due to its compactness, it easily fits in your backpack, handbags, easily harnessed around the neck with its harness as you take a walk in the nature trails. Small does not mean cheap either. Quality counts as well as the scope of its use. Canon binocular is an appliance friendly to anyone handling it with multifunction's suiting its work. The eyepiece is designed in such a way the distance is 14.5mm an ideal recommendable distance so as it accommodates your eyes and view with ease. Perfect if one has contact lenses as well. With the binocular held in the range of eyes, you still get the full focus on the field that you view. It has adjustable eyecups that accommodate your eyes and Canon 10x30 IS model with 1000 yards to view proper and right adjustments for the observer is guaranteed. With high amplification, the field view is narrowed down. But if the field- of view is widen then ease to see more objects. This binocular elucidates power. 10x of its magnification is superb for hunting as the object gets to appear 10 times up close to you. The diameter of the lenses is large enough to gather in the light needed for a bright view especially in the mild lit times, that's early morn and dusk sets. This helps you not to miss the awesome hunts as you easily spot them with the powerful cannon. The quality glasses used is of high good quality. Fuzziness and blurriness it eliminated with the intricate glass used. It improves the image quality to your preference. Q: How it the casing and is the case and other fixtures like caps and straps inclusive with the warranty? A: The casing is soft and well-padded and definitely is part of the warranty as a full gadget and not separately handled. Q: Does Canon 10x IS Ultra-Compact Binoculars has any camera function with it? A: It does not have any camera function integrated as they are stabilized and have great images to see. But being in the Canon family definitely, great cameras are easy to find in the house. Q: Does it have any optical zoom? A: No, it does not as the 10 times zoom is good enough as you see an object 10 times closer and the stabilizer feature comes in handy. 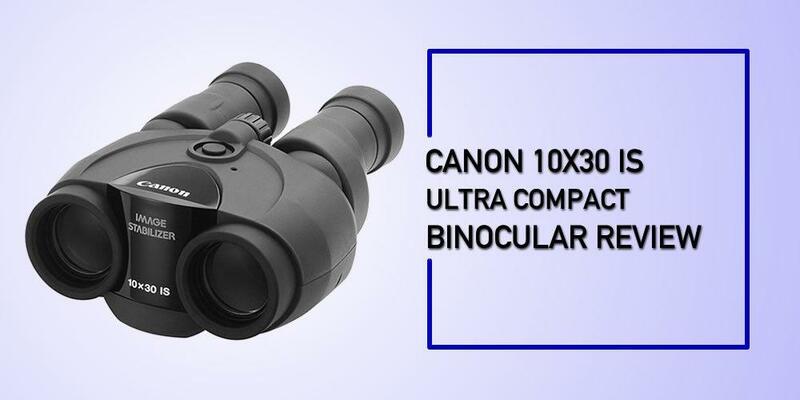 Canon 10x30 IS Ultra-Compact Binoculars comes in added modern features which enhances your hunting sprees, it's mid to high-value piece of binocular that we recommend for you to have. With the brand name being renowned for its superb quality products. With its stability features, you can use as well when in a vehicle or a boat and still get great images. It has a well-padded carry case with strong zip-lock that is stylish. It is a good gadget that is all rounded for diverse use in different locations and places. Of course, good handling and care are paramount.